The Ubele Initiative was founded with a mission to contribute to the sustainability of the African Diaspora community in the UK, and build a better future. In 2014, Yvonne Field, our founder, was visiting Wellington, New Zealand as part of a Churchill Fellowship. She saw a group of older white women cycling through the city and she couldn’t help but think - what if there were a group of elder black female cyclists in London? Healthy eating hints and tips. The project is currently based at Lordship Recreation Ground in Haringey, and is delivered in partnership with Rockstone Community Foundation, who provide cycling instruction and bike maintenance. 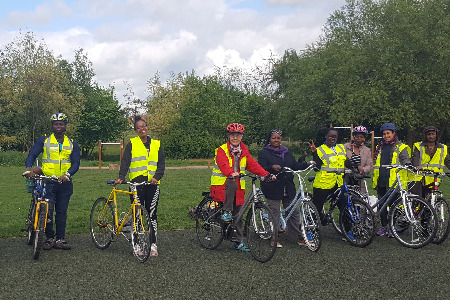 The aim is to address the barriers to cycling such as lack of equipment, lack of confidence - as well as getting BAME women to start to tackle health issues through regular exercise. Although WWoW is mainly targeted to BME women over 45 who live and work in Haringey, the course is open to all women. More than 70% of our participants have never been on a bike before and to date our oldest ‘first timer’ is almost 76 years old! Our grant from Cycling Grants London has been very useful, as it has enabled us to purchase bikes and other cycling equipment as well as access training and other opportunities. As a result, we have begun to overcome some of the typical barriers – for a start, you don’t need to own a bicycle to join the programme. We have also been able to pay for a qualified cycling instructor, to formally lead the sessions. They are able to teach participants not only how to ride - but how to ride safely. The programme is uniquely intergenerational as 3 female volunteers in their early 20’s are learning to support the cycling proficiency of the older women, alongside our qualified male cycle instructor. We are a relatively new inter-generational social enterprise, and we aim to increase our community’s capacity to lead, and create innovative and entrepreneurial social responses to some of our most stuck social issues. Our core values are collaboration, co-operation, community building, creativity and valuing all voices. Wise Women on Wheels is just one of several projects that the Ubele initiative is currently delivering within communities locally, nationally and internationally.